Daud Ibsa’s militia is not the Oromo Liberation Front. 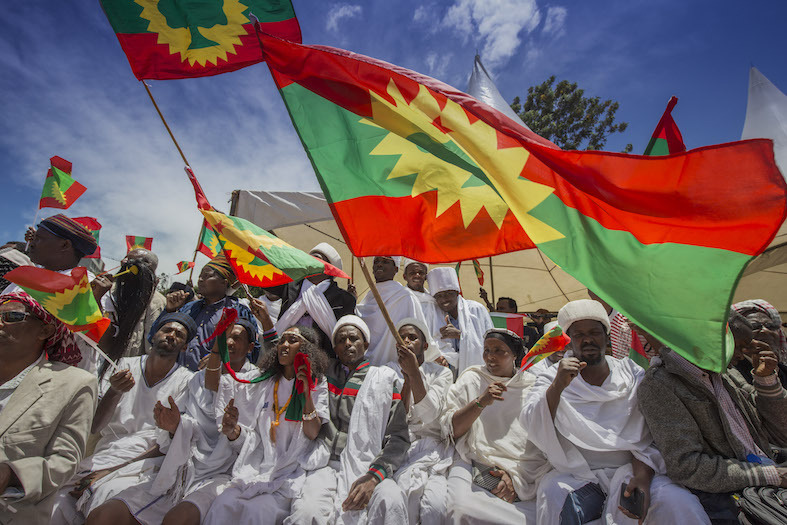 While the OLF has disintegrated, what it stands for still captures the essence of the Oromo struggle, and this contradiction is convulsing Oromo politics. The Oromo Liberation Front has experienced increasing turmoil since leaving the transitional government in the early 1990s after falling out with fellow rebels. There have been multiple disputes and splits over past decades. But importantly, Daud Ibsa started to brand his rump movement as the mother organization around 15 years ago. His guerrillas, commonly known as OLF-Shanee, and particularly so by critics, sporadically made lethal attacks on the army in peripheral areas of Oromia. Since 1973, the OLF has represented the aspirations and principles of the Oromo quest for hiree murteeffannaa—self-determination. In the past, it argued for secession. But despite its proud legacy, the OLF has disintegrated beyond repair. Any groups now branding themselves under the shadow of that grand organization are mere pretenders—very much including Daud’s. Yet OLF still captures the essence of the Oromo struggle and so abides in the heart of many patriotic Oromos. It is this contradiction that is currently convulsing Oromo politics. OLF-S’s hostile relations with the government continued until July, which marked the start of negotiations during Ethiopia’s ongoing political transition led by Prime Minister Abiy Ahmed. Daud didn’t want direct talks and proposed the mediation of a third party. However, reportedly due to pressure from President Isaias Afewerki, his group, exiled in Eritrea, was compelled to accept Addis Ababa’s proposal, and so returned home. An undisclosed agreement for peaceful political contestation was entered into between Daud’s group and the government. But it did not come into force, and ongoing deadly tension became the norm. The parties blame each other for non-implementation. So, the agreement is the bone of contention. Gammachuu Ayyaanaa, a defected colonel and part of the returned OLF-S leadership, has been enlightening on this subject in interviews with the Oromo Broadcasting Service. While briefing the regional broadcaster on the agreement, he addressed the vital point of the disarmament of Daud’s soldiers. The pundit alleged that the agreement did not imply disarmament as that amounted to falling captive. Meanwhile, the Ethiopian government, and particularly Oromia’s ruling party, claim that the agreement included the disarmament of OLF-S, regardless of the implications for its rebellion. The ex-colonel says that the deal was instead to create a buffer zone. In other words, there would be land controlled by Daud. Gammachuu also said that the intention was to establish a third party, such as a commission, to help manage the tensions between them. He claims that the fate of the OLF-S soldiers will be determined after the work of such a body. Gammachuu mentioned precedents in Burundi, Congo, Liberia and Rwanda. But those are not relevant because there was civil war there, while there is not in Ethiopia. Indeed civil war was far from the reality in Ethiopia until recent weeks when OLF-S upped its operation with the alleged assistance of elements linked to the former regime’s security apparatus. The Tigrayan People’s Liberation Front is aggrieved by the transformation, and sees OLF-S as partners in a nominally pro-federalist “strategic alliance”. Furthermore, rebel forces were competitive in the other examples, but in Ethiopia the government has overwhelming dominance; and, despite recent gains, OLF-S didn’t have territorial control in Ethiopia, as rebels did in the other countries. A buffer zone would only have been necessary if Daud’s soldiers were a threat. Yet, this is not feasible as Daud has never controlled territory, even in its western stronghold. The request was built on false claims——it was an attempt to exploit the negotiations to gain territory it has failed to control in the past. By establishing a territorial foothold, the OLF-S aimed to prove that third party mediation is needed, which, in turn, would allow the group to gain international legitimacy. Apart from its lack of legitimacy, Daud made a tactical error in opposing the appointment of another former OLF figure, Kemal Gelchu, as regional security head. Kemal has the requisite skills, even if he is a political rival, and OLF-S could have tried to work with Kemal, who is from eastern Oromia. At the very least, they should have refrained from shunning someone who once was their comrade. Daud thought appointing Kemal was a strategy of the ruling Oromo Democratic Party to obliterate them. However, the truth is that Oromia’s leaders wanted to compensate Kemal, an ex-member of the army, who left due to grievance. OLF-S is now soliciting international recognition under the guise of negotiation. This should be resisted. Daud’s movement is weak. It has lost support among the Oromo elite, most university students, many farmers, and, above all, the brave Qeerroo, including those who gave their lives for the cause of freedom. All now want an end to dictatorship and conflict. Ultimately, negotiation was part of a military strategy for Daud, while the same instrument was interpreted as a means of disarmament for the ruling party. But it is Abiy and Lemma who have the advantage, having played their hand well. Abiy has been smart not to arrest Daud, instead allowing him to look like unconvincing rebel leaders ensconced in luxury hotels. But the government has recently moved to detain Gammachuu and many others—it seems they have exhausted the politics of tolerance. Hence, the authorities are taking strong measures after a peaceful settlement proved elusive with this troublesome rump of a once formidable movement.